Our wonderful MCs – Bender and Molly! Who doesn’t know this duo!?! Bender is a well known radio host in Seattle that shows his commitment year after year to Seattle Children’s Hospital by hosting the One Big Kiss for Children’s. He is passionate about our hospital and our city and we are very lucky that he is with us again this year. And, Molly, well she is just a doll who we all got to know and love on The Bachelor and now keeps Bender on his toes! We are so thankful and honored to have these two as our MCs this year. They have donated their time, which shows there commitment to the hospital and to our city. Looking forward to a great night with them! Posted in Uncategorized	| Comments Off on Our wonderful MCs – Bender and Molly! Are you going to be the lucky winner of a Russell Wilson signed jersey?!? If you are a Seahawks fan, this is the event for you! Not only will we be auctioning off the signed jersey, but we have Seahawks jewelry, wreaths and decorations. GO HAWKS! Who wants to win an Apple Watch?!? That’s right…we will be raffling off an Apple Watch at our auction this year. It might be the cheapest Apple product you have ever bought. One raffle ticket is $10. Here’s to winning! Posted in Uncategorized	| Comments Off on Who wants to win an Apple Watch?!? 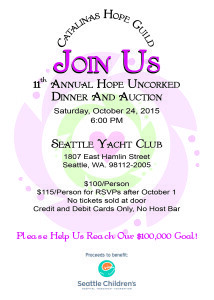 We cannot wait to welcome all of you to our event this year at Seattle Yacht Club. Our invitations have gone out and we are hard at work to make it our best even yet! If you did not receive your invitation or have questions about the event, please feel free to email our president at lindsayfiorito@gmail.com. thank you to all those who are attending! We are so excited for our event this year! Posted in Uncategorized	| Comments Off on We are Sold out!! 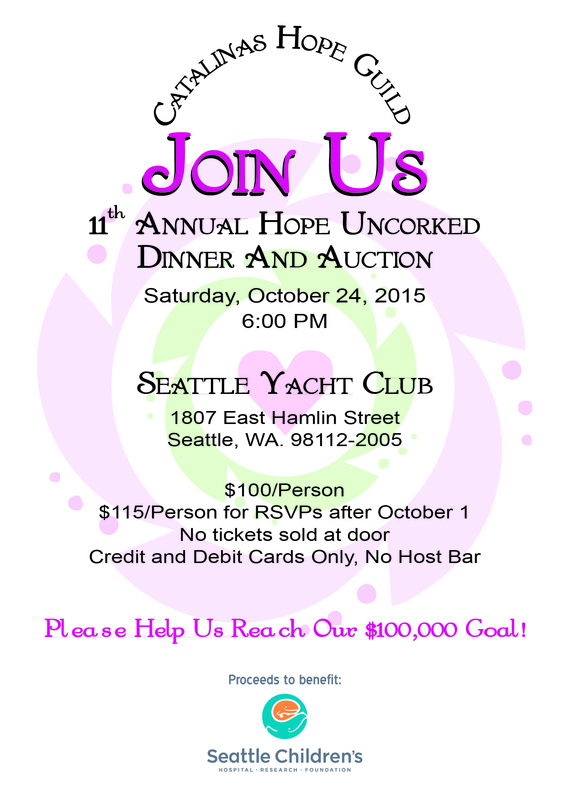 Hope Uncorked 2014 – RSVP Now! Space is limited! This year’s event will be held on September 27th 2014 at Glendale Gold and Country Club. Visit our Events page for more detail! Posted in Uncategorized	| Comments Off on Hope Uncorked 2014 – RSVP Now! Just an FYI that the 520 Bridge will be closed for construction the night of the event. If you were planing on taking the bridge, please make plans for an alternate route to the event. September 14th is right around the corner! We are excited to announce the live auction items for this year’s event! The items will be presented by MC Marty Riemer and The Stokes Auction Group. This years Raffle Items are an iPad, a collection of Glassy Baby Candle Holders and a $300 Nordstrom Gift Card. This year there will also be silent auction items, which will be revealed during the event. Posted in Uncategorized	| Comments Off on September 14th is right around the corner! Our 2013 Hope Uncorked Event is on September 14th! Our 2013 event is taking place on September 14th at the Glendale Country Club in Bellevue, WA. To learn more about our exciting MC, Marty Riemer, patient speaker and more, see our Events page! Details about our auction items will be added closer to the event. Hope to see you there! Posted in Uncategorized	| Comments Off on Our 2013 Hope Uncorked Event is on September 14th! Original Children’s Artwork for our wine labels! How exciting that we have an original drawing for our wine labels this year. Not only will the wine be available for your consumption at our event, but you can even order a bottle or 12 to take home with you! We are getting very excited! Posted in Uncategorized	| Comments Off on Original Children’s Artwork for our wine labels!